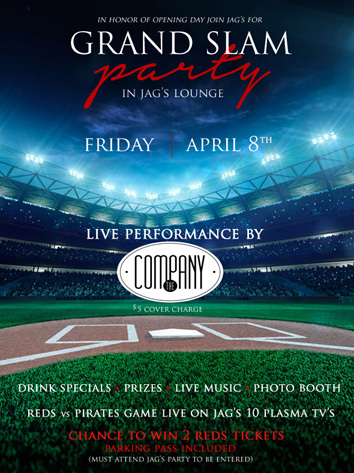 Join us Friday, April 8, 2016 for Jag's Grand Slam Party! Enjoy an All-American buffet 5-7 p.m., drink specials all night long and prizes throughout the night, including a chance to win two tickets to a Cincinnati Reds game (parking pass included). We'll also have raffle drawings for things like drink tickets, complimentary appetiers, scratch-offs, t-shirts and more! Don't forget your camera – we'll have a homerun selfie booth perfect for you to take pictures and upload to your favorite social media channel. Make sure you tag Jag's for a chance to win a Jag's gift card!